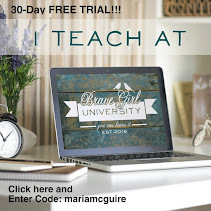 Believe Dream Create with Maria: Everyday Cricut...Day 2! I have to tell you, this is the first bigger project (layout) I have done with my Imagine and it totally made me fall in LOVE with my Imagine! Up until this point I have just done some cards with it and although I really enjoyed it, I think I didn't spend enough time with it to get the full potential of this machine. The possibilities are endless and it is so easy to match everything all at once. I keep looking at the layout thinking, WOW! this was all made with WHITE cardstock! I have been saving this picture of my daughter from back in August. It is one of my favorites of her lately. I wanted to do something special with it. I decided to use the Lori's Garden Imagine cartridge. I just loved all the soft images and birds on it. 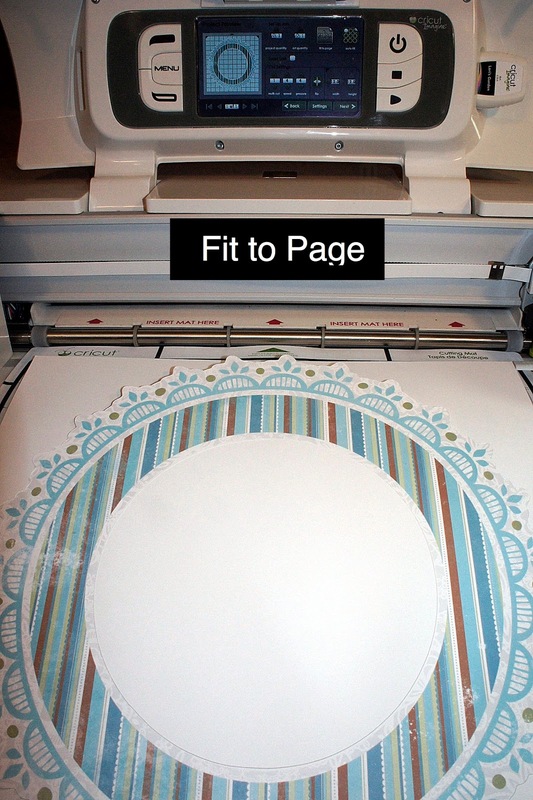 To start I printed/cut the scalloped circle at the Fit to Page setting. It was my starting point for the layout. These days, when I do a layout I just sort of "wing" it and keep building from one idea to the next. My next step....I loved this script image on the cartridge. I didn't know what I was going to do with it, but I loved it :) I printed it out as a edge to edge full bleed on the Imagine so I had a entire sheet of it. Just LOVE this option on the Imagine. 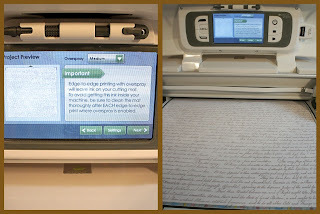 No need to hunt for paper, just print it myself! Next, I decided that I wanted the title of my layout to be Shine. I searched on my Gypsy for this word and found one on the Country Life cartridge...couldn't get much opposite of Lori's Garden, LOL! That is the beauty of this machine....I inserted Country Life in the left hand side of the Imagine (as seen above) pulled up the Shine image and then colored it with a color from my Lori's Garden palate. Instant match! Also, you can see the the picture next to it, that I pulled up some of the stock shapes on the Imagine, picked a square and made some small squares of color to use for my sentiment I was going to stamp. Instant pattern paper matches. Time for background paper. This is where I really had fun! I did a edge to edge print again. This time in a light green from the palate on Lori's Garden. 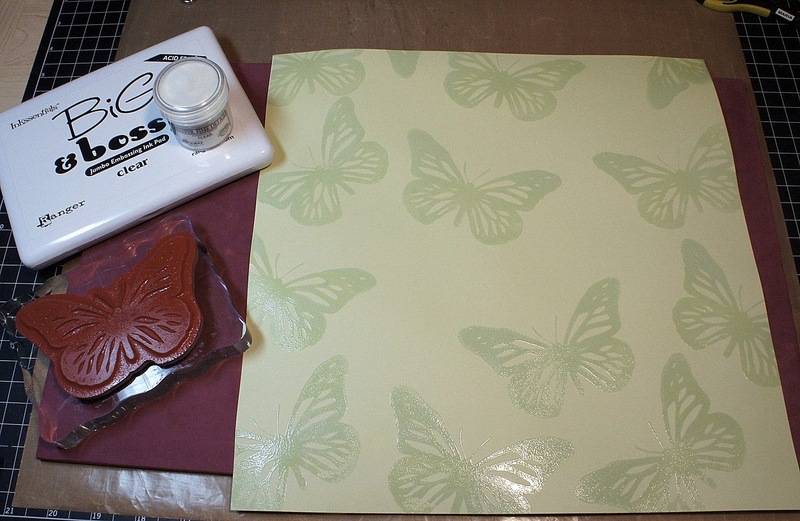 I then used a butterfly stamp, clear embossing ink and powder and made my own custom background paper that matches perfectly! 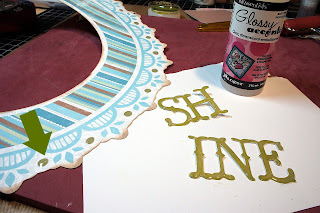 To make the title "shine" I made my own epoxy letters (no need to go buy them at the store) with Glossy Accents. I did two coats to really make them dimensional. I really like to do this because of instead of going to the store and picking something all ready pre-made I can pick the color and font for my project! To finish it off...a little Prima trim and flowers. Some crystals on the title and a stamped sentiment on the paper I printed out. The bird and the journaling spot are also from Lori's Garden. I hope if you have an Imagine this project inspired you to sit down and use it and if you don't have one, I hope you are inspired to use your Cricut to make a layout today and document your life! Lori's Garden = Scallop circle FTP, Title Mat 4.0", Bird 3.0", Journal Circle 1.5"
Country Life = Shine @ 1.5"
beautiful LO! and daughter... question: with making all you have with the Imagine... has the ink lasted through all of it?? this is my biggest concern - ink. The layout AND the photo are each beautiful, but together, they're heart-stopping! I "imagine" I need to start thinking about getting an "Imagine" now.... Thank you for sharing! I was absolutely convinced I did NOT want or need an Imagine, until I saw this post! It's beautiful! Thanks! 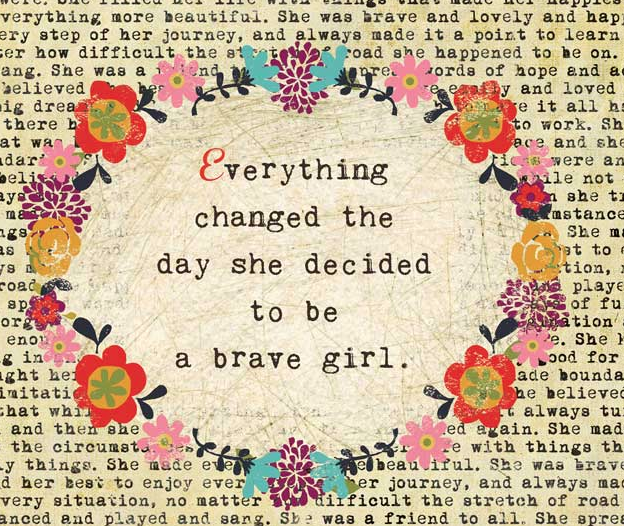 Amazed and inspired. Absolutely learned several things today and can't wait for my regular work day to be done so I can play. Very pretty Maria. I've noticed in all your family photos your daughters big, beautiful eyes!! 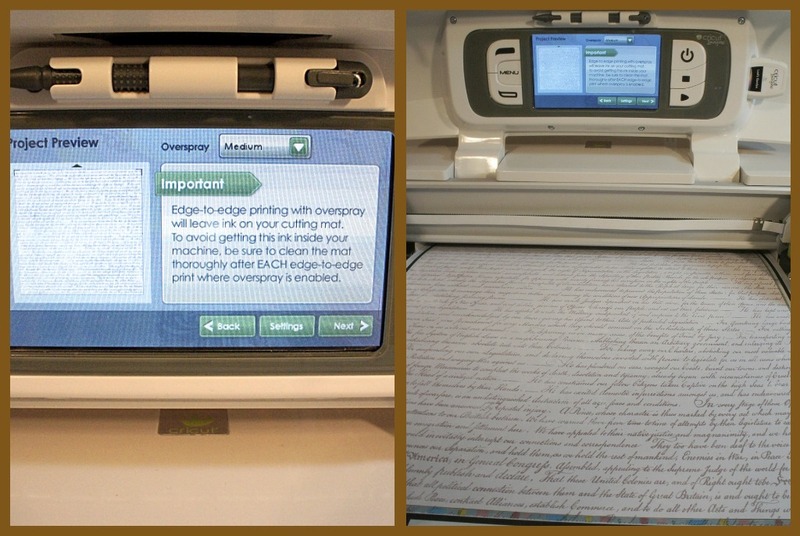 I do not own an imagine and probably never will, but I do like to read and learn what a fabulous machine it is. I have been very lucky to just get an expression last month. I am loving it! TFS, I love your work. Stunningly beautiful!! Maria, this is just gorgeous!! What an elegant layout! Everything I'm hearing about the Imagine sounds pretty tempting. I guess I'll have to start doing some homework. Thanks! Maria, that is absolutely Gorgeous! You make me want to buy an Imagine. Thanks for sharing! Maria, what a stunning LO. The page is beautiful and so is your lovely daughter. you are so talented, great job. pretty daughter and great layout. this layout of your daughter is beautiful, what a wonderful job you did.